A mysterious countdown has begun ticking away on BioWare's websites, and we have absolutely no idea what it is. Seriously, we don't have a clue. If you're hoping that I had some kind of "wink wink, nudge nudge" thing going on when I said that we have no idea what this is all about, you're in for a disappointment. We're completely in the dark. But that doesn't mean we can't speculate! The clock has a little less than six days remaining at the time of this writing, meaning it will come to an end at noon EST, on March 29. It's up on the main BioWare site as well as the Dragon Age and Mass Effect websites, which may or may not suggest that something pan-BioWare is going to happen. A look at the source of each of the sites in question revealed only one thing unusual: The ominously named div class, "OMGWTFBBQ." Could another Dragon Age expansion be on the way? Perhaps new DLC for Mass Effect 2? The official opening of The Old Republic beta? Dragon Age 2, or Mass Effect 3? 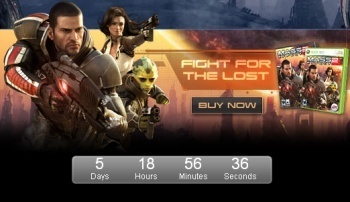 BioWare isn't saying much; in a message posted in the BioWare Social Network forums, the always-informative community coordinator Chris Priestly said only, "Hmm... seems to be a countdown clock on each BioWare page. Main site, Mass Effect, Dragon Age... Must be something cool coming." A lot of people seem to think a Mass Effect 3 announcement is on the way, but I'm going to put my money on a new MDK release. Hey, when I predict, I predict boldly. What's your guess?